Calvin Klein will launch Eternity Night and Eternity Night for Men in August. 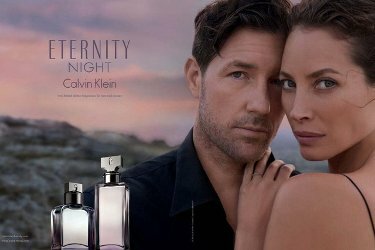 The new fragrances are flankers to 1988's Eternity and 1989's Eternity for Men; the scents will be fronted by Christy Turlington Burns and Ed Burns. Eternity Night ~ a creamy floral with pink pepper, elderberries, quetsche (prune), frangipani, wisteria, jasmine, musk, sandalwood and tonka bean. In Eau de Parfum. Eternity Night for Men ~ with coriander, paprika, plum, clary sage, violet leaf, lavender, vetiver, sandalwood and cedar. In Eau de Toilette. Calvin Klein Eternity Night and Eternity Night for Men will be available in 100 ml. Interested in Calvin Klein Reveal, though…hoping it is better than what they’ve been making lately. Don’t know a darned thing about it but the name though. They do sound good. The women’s version would probably appeal more to me. I believe the “quetsche” is the damson (Damascene) plum, which is often used in perfumery. I do eat these plums, but have never smelled the flowers. I also adore elderberries, and see that the flowers are listed as a note. As I write, there are elderflowers in a ziplock bag in my freezer, waiting to be made, one of these days, into elderflower pancakes. I was almost too late in gathering them! Have never eaten elderflowers! They’re usually made into liqueur, right? You can make a soft fermented drink from them and they smell and taste wonderful! Yes, there are elderberry wines and cordials and stronger spirits and syrups. IKEA usually has some very nice elderberry (non-alcoholic) drinks, or at least they used to, here in Holland. Hmmm. I’m unfamiliar with the fermented drink but it sounds delicious! I had learned to make the pancakes many years ago, following a German recipe from one of my former in-laws. Now I’ve learned the Dutch make them as well. You make a batter and dip a whole umbel (bunch of flower heads on one stalk) into it until it’s thoroughly coated and then fry it. Delicious! I have turned too many friends onto this and am always careful to tell them to be sure to leave enough on the trees to develop into berries for the birds, etc. You can google for recipes. Be sure to know how to identify it. You don’t want to take anything poisonous by accident! Just to add: raw elderberries are highly toxic! I love elderflower as a flavor. St. Germain liqueur is delicious, if a bit pricey. I forgot about Monty Python. I was just thinking of Aunt Abby and Aunt Martha and their arsenic-laced elderberry wine. They have REALLY photoshopped those faces, particularly Ed Burns’. I would never have recognized him. The two Obsession Night scents were not at all nighttime, nothing dark or mysterious about them at all. I wonder how these two will fare.